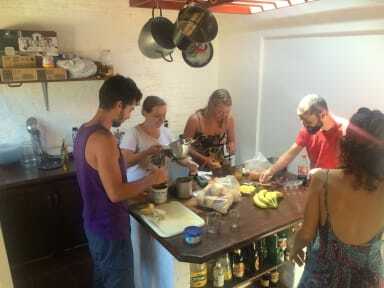 Piedra Alta Hostel is the best place to relax and have a good time in La Pedrera. Shared rooms for the best price. 6 mixed rooms, 3 with private bathroom. One room exclusively for women. There are also 5 shared bathrooms all of them with hot showers. All the comfort, with the fun and chilled atmosphere of a hostel. A big living room inside, with fireplace and musical instruments. And outside there is a large deck with seats and tables, barbecue, outside kitchen and a nice spot to enjoy your time, with the stars and the sun.It is a very important part of our hosteling mission to reduce our ecological footprint. We invite you to celebrate life, composting the organic, recycling and separating the waste. Reducing to the minimum the usage of water is also a important part. Located in the heart of la pedrera, in the main street, one block away from the beach of high rocks and great views. Only a few minutes walk to Playa del Barco y Desplayado, the market, the bars, artesanias and boliches. Have fun and enjoy , respecting Nature and all that surrounds you!